This construction of an additional Cebu outlet was decided by the principals of FAPC to address the growing vehicle sales and service demands in the province of Cebu. 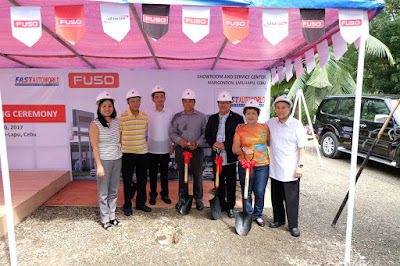 The Fuso dealership will also be constructed beside the Mitsubishi Motors Lapu-Lapu branch to specifically attend to the medium to heavy truck requirements of Cebu businesses. These two separate facilities are expected to start operation in November 2018. The newest additions to MMPC’s current network are located along ML Quezon National Highway Barangay Marigondon, Lapu-Lapu City. The 10,505-square meter land is divided into two to give way to both facilities. An additional 2,790-square meter area is reserved for future expansion. The FAPC – Lapu-Lapu branch will feature a showroom which can flaunt nine (9) car displays. The dealership will also be equipped with a full service center with twenty-three (23) service work bays which can accommodate various services from periodic maintenance to major body pairs of passenger cars and light commercial vehicles. Meanwhile, the Fuso outlet of FAPC is going to have a separate showroom which can display up to five (5) light to heavy-duty trucks. This Fuso outlet is also equipped with seven (7) work bays which can cater all types of service for trucks. The groundbreaking ceremony was attended by MMPC’s Mr. Shigeru Ogura – Managing Director and Executive Vice President for Marketing, Franjudel T. Racadio – Assistant Vice President, Fuso Sales and Marketing, Julius D. Nera – Assistant Vice President for Fuso aftersales, Masaaki Yamada – Senior Manager - Vehicle Sales and Marketing, FAPC Chairman, Mr. Victor S. Chiongbian, Albert S. Chiongbian – Vice Chairman, Ms. Julia V. Menchavez – President. Attending for the local government unit are Honorable Paz C. Radaza – Lapu-lapu city Mayor, Honorable Marcial A. Ycong – Lapu-Lapu city Vice Mayor, Honorable Lucrecia M. Amores – Marigondon Barangay Chairman.